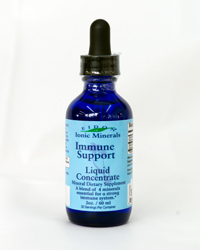 Eidon Immune Support is an incredibly effective formulation designed to boost your immune system. The blend of zinc, selenium, sulfur and silver is a combination optimized to give your body the essential nutrients required to effectively and naturally deal with the cold and flu season. Also, wounds and infections respond well to both internal and topical application of Eidon Immune Support. The immune system gains strength from minerals to synthesize proteins which make up all the cells of the body. These essential minerals play the following roles: ZINC - Activates the enzymes of our immune system. SELENIUM - Inhibits viral mutation. SULFUR - Calms the body's inflammatory response. SILVER - Provides a natural defense against bacteria. A list of abstracts from the National Library of Medicine (PubMed) along with further research on the importance of these minerals for a healthy immune system can be found on our Website (See: Research). This mineral blend is a must for every medicine cabinet and every traveler.